Echo is unique in that a single user can have different permissions across multiple domains. To accomplish this, permission setting are not part of the user account and instead exist as separate records associated with the users. 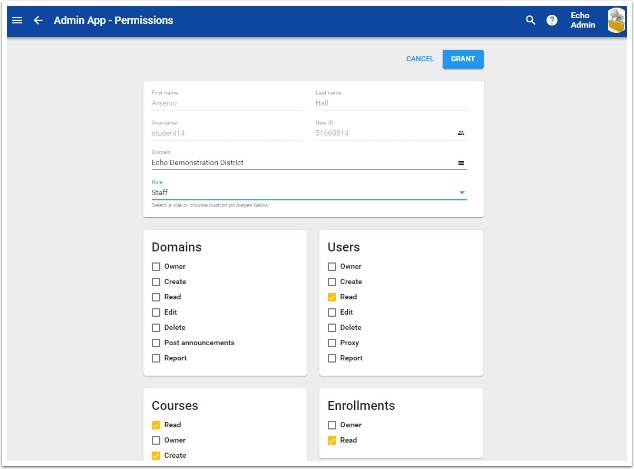 Domain permissions are added as a second step in the user creation process. 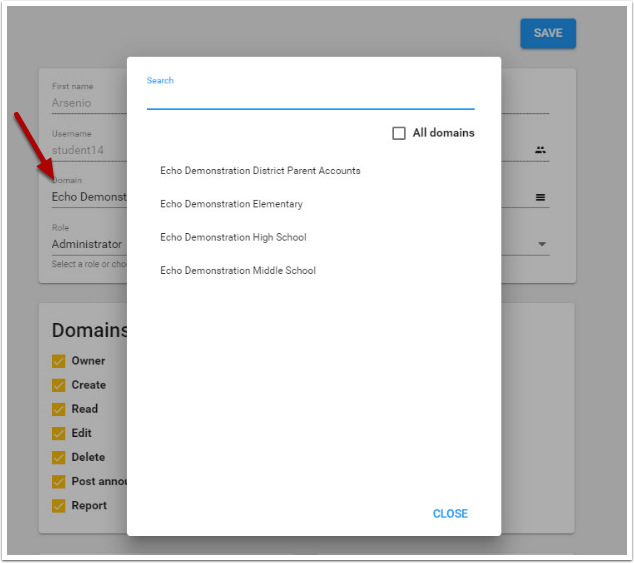 Teachers and other staff members must be granted domain permissions in order to effectively use Echo's features. Students and parents do not need to be granted permissions as the default permissions are sufficient to access courses they are enrolled in. Open the Domain tool from the Main Menu; you can also grant permissions with the Users tool. Select the Permissions in the tabs bar and click Grant. Open the User tool from the Main Menu. Click Grant [plus sign] assign the appropriate Role. Echo Admins don’t need separate accounts in each domain one simply needs Domain Permissions set to the other domains. This feature is also useful for staff members who travel between schools and need access to courses they are instructing. Begin by selecting the user you wish to grant permissions to and from the Domain Permissions tab, click Grant. From the Select Domain screen select the domain(s) and role to assign., and click close and save. 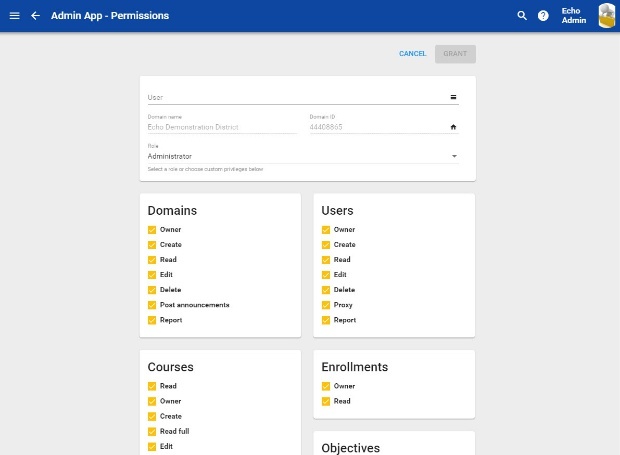 Once you have granted the domain permission to the user you should now see the school that the user has permissions to access. To remove permissions, check the user's box on the Permissions screen and click Revoke from the vertical menu. To revoke multiple users' permissions at once, check all desired boxes before clicking Revoke. Click the Role to edit to make permission changes. To import permissions using a tab-delimited or comma-separated file, click Import from the vertical menu.